Author, editor, artist, actor, and blogger. A few weeks earlier, I had been reading the cheery posts of authors such as Beth Ciotta, author of “The Weekend Wife,” presented by James Patterson. Then, Loretta Wheeler, author of “The Verandah,” and other Texas-based authors began posting their harrowing experiences while riding out humongous Hurricane Harvey. Stunning in its ferocity, Harvey overwhelmed the city of Houston. Only days later, I found myself inundated by posts about a huge new storm, Hurricane Irma, as it tracked its way towards the Florida peninsula, eventually unleashing its torrential wrath on a new set of authors, my Florida writer-friends on Facebook. As an author of Florida fiction myself (amazon.com/author/tinamurray), I had a poodle in this fight. My novels, “A Chance to Say Yes” and “A Wild Dream of Love” and the yet unreleased “A Big Fan of Yours,” are set in Naples and the Caribbean isles. However, I was not in Florida at the time Irma struck. I had to rely on the observations of others. If you want vivid, first-hand accounts of natural phenomena, who better than bestselling authors to deliver the literary goods–with photos! Some of the writers, such thriller-author Susan C. Klaus, sheltered in place as the storm advanced. So did mystery writers Jean Harrington, author of “Murder on Pea Pike” and Nancy J. Cohen, whose latest bad-hair-day tome is “Hair Brained.” Nancy shared advice about weathering hurricanes and posted a photo of herself, cute and comfy, inside her safety closet. Other writers, such as sci-fi author Linnea Sinclair, headed out of harm’s way. Bestselling women’s fiction author Heather Burch, whose new release is “Something Like Family,” chose to seek higher ground. While there, Heather updated readers on the status of her sons, who evacuated safely. Fantasy authors Sandy Lender, “Choices Meant for Gods,” and M. B. Weston, who penned the Elysian Chronicles, evacuated, also. When Sandy flew the coop, she took all her pets birds with her! Numerous other local authors, including Lynnette Austin and J. W. Thompson, posted their experiences. Each author made a unique contribution to what became the gripping, ongoing saga of a state under siege. On the east coast, writer Dave Barry turned anxiety into laughter in his humorous piece on Hurricane Irma preparations, which appeared in the Miami Herald. Technically speaking, Dave and I are not Facebook friends. I have never even met him. However, he is a Florida writer, and his humor did help break the online tension. Other writer-related reports brightened my outlook, as well. In battered Key West, Hemingway’s cats were pronounced safe. No doubt Mr. H. would have documented the whole event on social media had it existed in his day. Makes you wonder, doesn’t it? What would Ernest Hemingway have posted on Facebook? Who knows? He might have created a page devoted to cats. Speaking of Hemingway, you might want to check out the latest book by may Hawaiian writer-friend, James Charles, “My War with Hemingway.” I hope to blog more about it in the future, but not now. This post is about Irma! Regardless, I am grateful that Hurricane Irma petered out as it moved north, sparing my friends, family and the mausoleum building housing the grave of my parents. As millions of people return home, survey the damage, mourn the lost, and await the coming of gasoline supplies and electrical power, they can be proud of their state’s organized response to impending catastrophe. Life in Florida, as you see, can bring more than lazy daze on a sunny beach. It can bring intense drama and tragedy, with a smattering of comic relief. What better place for writers? Seriously, my heart goes out to all those affected by Hurricane Irma. I wish you blessings and a speedy recovery. Thanks to all the emergency responders who sacrificed to help the victims of the storm. Thanks to the writers who shared their stories. Thanks to my non-writer friends, such as Krista Denizeri and Sonja Miller, who also kept me informed. Thanks to everyone whose posts I shared on my Facebook page (Facebook.com/tmurrayauthor). Speaking of writers, I am sending a good word here to bestselling author Dakota Cassidy, a social-media friend of mine who is recovering from heart surgery. My prayers for you, Dakota. I look forward to receiving your charming posts once again, and a return to cheerier times. Although beautiful enough to have become a movie actor, Claudia Murray was intelligent enough to become a screenwriter, director, and producer instead, when she first arrived in The City of Angels, not long ago. Now directing her debut film, a theatrical short, “Gringa,” Murray could not be sitting prettier. Drawing upon her own heritage–she’s Cuban-American on her mom’s side and Southern American on her dad’s–her first film reflects the resultant emotional and intellectual duality she has experienced since her childhood in Florida, as well as her empathy with the plight of the Cuban people. Co-written with colleague Lana Link, “Gringa” features established actors Lidia Porto, Ruben Rabasa, Jorge Emanual Berrios, and Mario Barra, with Ana Cecilia in the title role. It has been produced by The Moving Picture Institute (thempi.org), a non-profit film company which specializes in making movies about freedom. No stranger to success, Murray is also a member of the team who won a Webby in 2017 for a political-humor site: WetheInternet.tv (Facebook.com/wethinternettv). Do you have dreams? Of course you do. Everyone does. You probably have one special daydream, right this minute, that you wish would come true. Perhaps you wish to go back to school, start a business, or lose weight. Maybe you long to write a book, create a work of art, or compose music. Whatever your dream, it is important to you. So, let me ask you a second question. Do you believe you can turn your dream into a reality? Not everyone believes that. If you do believe it, I applaud you because not only are you imaginative, you are creative, as well. More power to you! To fuel that power, I would like to offer you five common-sense suggestions to aid you in realizing your dream. These five essential steps, along with other steps specific to you and your situation, will assure that you are headed in the right direction: up! Believe me. I have been there. I have trekked the trail of self-motivation more than once. As someone with three college degrees and three published books on my Dreams-Come-True Done List, I have learned a thing or two about hiking the creative hill. Although I have not yet attained all my own dreams, I have learned how the process of accomplishment works–and I have realized something else. This process can be applied to any creative endeavor. I am still using it, and you may use it, too. — Turn your dream into a goal with objectives. — Believe and go for it. — Finish what you started. Turn your dream into a goal with objectives. This first, crucial step takes place inside your conscious mind. You alone are in control of it. Decide to change your life by focusing on how to bring about the result you desire rather than by crying, “If only blah-blah…” When you receive your first inkling of how–that is, what action steps are possible–you will change from being a dreamer to, a goal-setter. The list of actions–the behaviors needed to reach your goal–are called objectives. When I studied Education in grad school, we learned how to write lesson plans. A lesson plan was comprised of an overarching goal with measurable objectives for reaching that goal. Objectives can be checked off the list as you complete them. The lesson-plan concept can be translated into everyday projects, as well as, big dreams. For example, if my goal is to bake a cake, my objectives include such actions as purchasing ingredients; assembling utensils and bake ware; preheating the oven and so on. On the other hand, if I wanted to write a book, I would develop a different list of objectives. One of my objectives might be, “I will write three pages a day for the next six months.” This would help me complete my manuscript. That is how objectives guide you to your goal. If you want an in-depth explanation of such goal-setting strategies, read “The Complete Idiot’s Guide to Reaching Your Goals” by Jeff Davidson. Once your plan is established, however, implement it, and work hard at achieving results. Believe and go for it. Activate your faith. “The Power is Within You,” wrote Louise Hay, in her book by the same name. As you embark on your journey, hold your goal in your imagination, as recommended by Neville Goddard, Wayne Dyer, Ernest Holmes, Mitch Johnson and even loftier spiritual leaders. Keep the goal uppermost in your mind. This practice helps to actualize your goal–but you must not stop there! For the mental work to pay off, you must act. Do not give into fear, doubt. despair, or ridicule. Do not second-guess yourself. In his gripping book, “Dare to Succeed,” Mark Burnett, the wildly successful creator of “Survivor” and “The Voice“ stated, “Success is about results, not intentions. It’s about action, not inertia. It is about wanting something so badly you refuse to quit, no matter what.” This type of drive is generated by intense focus. You can develop that, too. Encourage Yourself. A most important step to take when advancing towards your goal is to become your own encourager. What you say to yourself matters. Positive self-talk will carry you through hostile, rough terrain. Negative self-talk can derail your efforts. “Attitudes are more important than facts,” wrote Dr. Norman Vincent Peale, author of perennially popular books such as “The Power of Positive Thinking” and “You Can if You Think You Can.” Above all, maintain your internal flame. Make sure your thoughts, words and actions align with the higher power. Seek out humans, too– mentors, believers who are like-minded and ambitious, as advocated by Napoleon Hill in his classic book, “Think and Grow Rich.” Ignore the negative comments of people around you who may want to see you fail–or who don’t know how to bring dreams to pass. Whatever the source, negative thoughts are debilitating. Shut them out. Override them with positive, encouraging affirmations in your own mind. If it helps, think of this practice as running a powerful, new software program in your brain. You are in charge of which thoughts you choose to entertain. Finally, be grateful for the folks who encourage and support you. Such people can be invaluable to your success. Reciprocate wholeheartedly.. Finish what you started. Once you have reached the summit, this final step can feel as though you’re slogging through snow. But without it, failure is assured. You do not want failure. After all your effort, you want success. If you have dropped a project, pick it up again and work on it until it is completed. Resting is okay. Quitting is not. Do the very best you can. Do everything you can think of, and lovingly attend to each detail as you work to achieve your goal. In the end, standing on the peak, you will be triumphant. Even if you are exhausted from the struggle–even if you have to limp your way there, wounded and weary–keep going. Even if you think the thing is no good, finish it. Please ponder this statement attributed to the sage, Lao Tse. “By being as careful at the end as at the beginning, failure is averted.” I learned that lesson the hard way. I urge you to develop the lifelong habit of finishing what you start. If you do, you will never be mired in regret, regarding what might have been–and you will be free, always, to move on to your next, exciting bout of dream-creation. Besides, you will love the view from the mountaintop. If the end result is not what you had hoped, then learn from your mistakes and apply your hard-earned wisdom to next-time. Looking back, let’s review our essential five steps. Dreams come true if you turn your dream into a goal with objectives; believe and go for it; stay focused; encourage yourself, and finish what you started. You can learn to turn dreams into realities, one dream at a time. Remember, like everything in life, this procedure will take practice. I believe in your dreams of good. If you do, also, and you would like to share your results, I would love to hear them. One of my dreams–now a goal–is to make a difference in the world. “In fact, the easiest way to get what you want is to help others get what they want,” wrote Deepak Chopra in his book, “The Seven Spiritual Laws of Success.” What’s the connection? If I can help you to realize your dream, it will go a long way towards helping me realize my own. Therefore, I hope you a have happy and fulfilling journey from Dreamland to Manifestation. How do you feel about country music? Have you ever been to Nashville, Tennessee? Nashville is home to America’s country music, as well as, generations of country-music celebrities. If you aren’t familiar with the history of country-music, I know where you can learn about it. Read on. On the other hand, if you are a long-time country music fan, and you have a hankering to see Glen Campbell’s leather pants or Elvis Presley’s Army shirt, this same place will delight you. The entire tour is fascinating. You can lose yourself easily as you wander in wonder. When, at last, you take a break from viewing, treat yourself to a Moon Pie or Goo-Goo Cluster. Either of these down-home pleasures will sweeten your adventure in country-music history. In addition to its permanent collection, the Museum offers varying exhibits related to today’s popular country-music stars. Recent exhibits include “Brad Paisley: Diary of a Player.” This exhibit offered fans the opportunity to explore and appreciate Paisley’s rise to fame. Now a major recording artist, Paisley began his career as a child prodigy, one who learned his craft and developed his talent from an early age, to become an accomplished guitarist, singer, and songwriter. You can find such information and much more on the facility’s website. Other recent exhibitions were “Homegrown: Zac Brown Band,” “Alabama: Song of the South” and “Charlie Daniels: Million Mile Reflections.” Such exhibits engage and enlighten fans and newbies alike. One popular exhibit, “Dylan, Cash, and the Nashville Cats: A New Music City,” was timely. While the exhibit was up, Dylan won the Nobel Prize for Literature. Be sure to check upcoming exhibits and plan your visit accordingly. Nashville itself is growing both in population and sophistication. The museum facility is located near the city’s enormous new convention venue, Music City Center. What’s more, it is connected, by a corridor of shops, to the grand, new Omni Hotel. Luxury and fine dining are readily available. But you can grab a quick bite at the Red Onion, on-site, or other nearby eateries. Want to duck outside for a spell? Relax with a drink? Listen to live music? Go ahead. Your Museum tickets will be good for the whole day. Head over to Broadway, a busy main street and tourist destination, lined with honky-tonks, bars, and restaurants. If the atmosphere is too hectic, take a stroll along the Cumberland River or across it, on the walking bridge (see photo). Refreshed, head back and continue viewing exhibits. Be sure to visit RCA Studio B, an off-site tour the Hall of Fame/Museum offers at an additional price. This historic recording studio, located on famed Music Row, was used by many of the greatest popular recording artists of all time, including Elvis Presley. It is a must-see for anyone who grew up listening to the hits of the 20th century. Don’t be surprised if you have a spiritual or, at least, an emotional experience while there. The Country Music Hall of Fame and Museum offers more than memorabilia, interactive displays, and archival recordings. 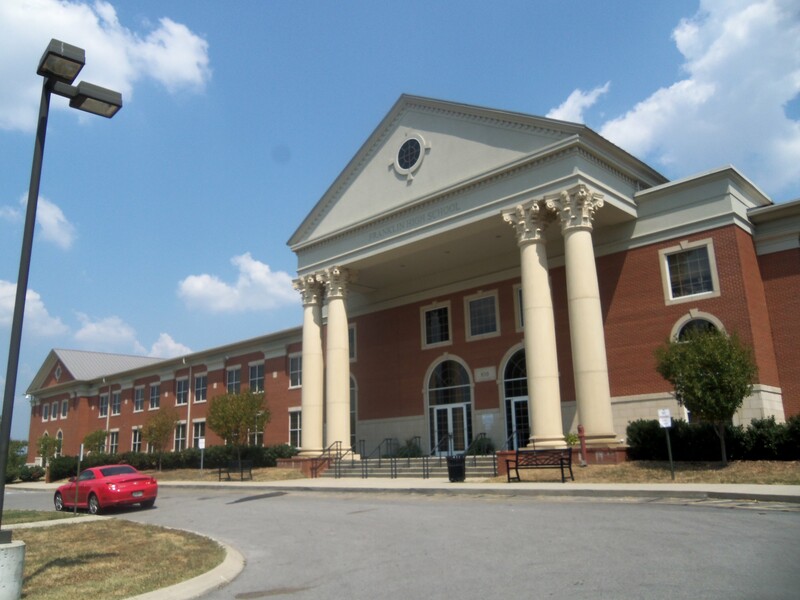 It offers music-related classes, workshops, songwriting events, school programs, and family-oriented activities. (Fiddle lessons, anyone?) If you’re staying in Nashville for a while, take advantage. Be sure to sign up for the online newsletter, too, to keep abreast of new offerings. Today’s Nashville–a.k.a. Music City, USA– is the laid-back hub of professional musician and writers of all genres. Residents pride themselves on not making a big deal out of spotting stars, many of whom live in the area or visit often. However, the CountryMusic Hall of Fame and Museum proves how proud Nashvillians are of their musical heritage. They would love to share that heritage with you and yours, so come on down, y’all. The Museum’s entrance is located on Demonbreun Street (pronounced “De-MON-bree-uhn” by locals) between Fourth Avenue South and Fifth Avenue South. The price of admission for one adult is around $25. Discounts are offered for children, seniors, and members of the military. Tour packages are available, at various prices. Contact the museum for details or visit the website. Parking: TCMHFM’s website suggests the link, ParkItDowntown.com. Things change change over time, of course. You’ll need to verify this information and check for updates prior to your visit. Also, note that the area experiences four seasons. Plan your trip accordingly. Whenever you do decide to visit the hallowed halls of Music City, I hope you have a fine, old time. Welcome back to Celebrity Roads Trips. I’m saying that to myself, as well as to you. I have not posted on this site for six years. Believe me, a lot has happened during my time away. When I tried to return to this site last week, I had some trouble accessing it. Many thanks to Sudipto at WordPress for helping me regain access to my account. I want to change slightly the focus of this blog. My original purpose was to visit physical locations that related to movie-making. However, in the meantime, TCM has covered that issue pretty well! I still want to do some of that, but I am expanding the focus of this blog to include traveling to discover all things creative. I’ll catch you up on my recent activities in coming blog posts, and I look forward to receiving your comments. Please visit my new Amazon page at amazon.com/author/tinamurray. My Facebook page, A Chance to Say Yes, is Facebook.com/tmurray author. It focuses on my two published novels, A Chance to Say Yes and A Wild Dream of Love. My Twitter page is Twitter.com/tmurrayauthor. If you like and follow me anywhere, let me know, and I will return the favor. Thanks, and have a lovely new day. Whose own movie refers to her as “the most popular teenager in the world?” You’re right! It’s Hannah Montana, a.k.a. Miley Cyrus. A native of the Nashville, Tennessee, area, Miley chose to film on locations in the area when making her huge hit film, Disney’s Hannah Montana: The Movie. According to Wikipedia (http://www.wikipedia.org/wiki/Hannah_Montana_The_Movie), the historic town of Franklin, Tennessee, and the nearby Cool Springs Galleria were used for some of the location shooting. We visited two locations used in Hannah Montana: The Movie. First is Franklin High School. This stately temple of American education is pictured here. All red brick and white columns, it’s a very photogenic place, located on Williamson Boulevard, a mile or two west of charming downtown Franklin. Second is the Belk Department Store, located in the Cool Springs Galleria. 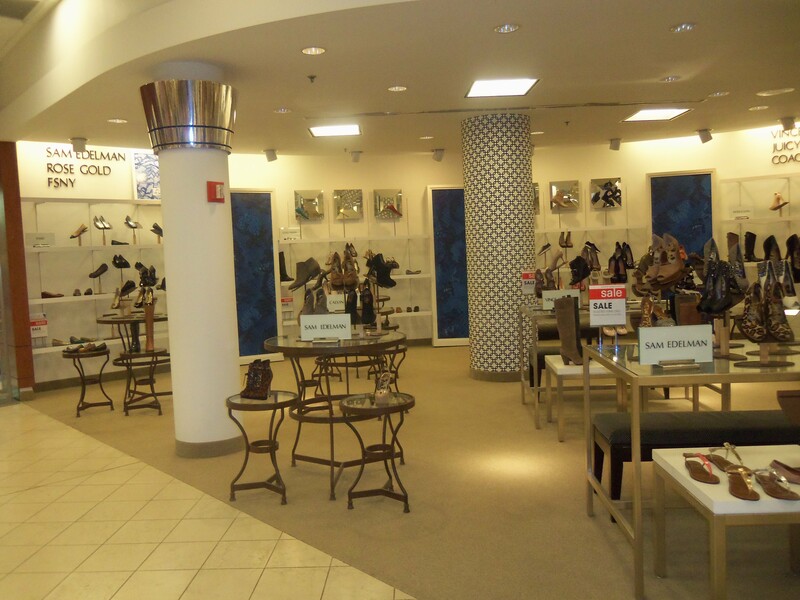 The shoe-fight scene between Miley Cyrus and Tyra Banks took place on the first floor of Belk’s in Ladies Shoes. A friendly salesperson assured me that I wouldn’t recognize the spot because it now looks different from the way it does in the film. She said her own daughter didn’t recognize it when she saw it. I took a photo of the spot anyway. It’s near the first-floor entrance to the mall and is pictured here. As soon as I unearth more of the movie’s locations in Williamson County, I’ll post those, too. Where to eat: Franklin fairly overflows with delicious dining choices. 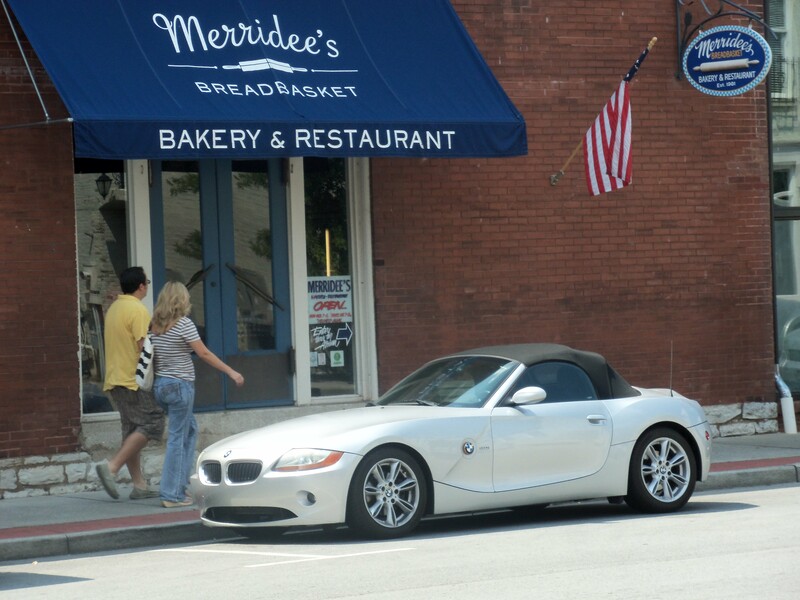 On this trip, we lunched at Merridee’s Breadbasket (www.merridees.com), a favorite of my cousin, Gwen. Freshly baked breads and pastries, such as chocolate cake and gooey cookies are quite tempting and hard to resist. Those of you with willpower can stick to the superior sandwiches and salads with a refreshing glass of “Northern” tea (unsweet). Too funny!I confess I saw this on a sign on an urn at the Moe’s in Cool Springs, a local favorite for those who like quick Tex-Mex food. Cool Springs is loaded with tasty eating spots, too. Naturally, the Food Court at the Cool Springs Galleria is very convenient to Belk’s and offers something for everyone to enjoy. If you go: Franklin is located at Exit 65 off the I-65 freeway. Cool Springs Galleria is just to the north. You can use Exits 68b or 67. The seasons do change in Tennessee, so plan your trip accordingly. has become a beloved area showcase for classic and contemporary films, as well as live acts and concerts. It’s located in downtown Franklin. Williamson County also is home to Civil War history, for those who want to include a visit to historic homes and battlefields in their trip itinerary. Williamson County is reportedly the wealthiest county in the state. Farms and ranches of rolling green hills surround its populated areas.